From the time I was a little girl, cat eyes fascinated me. At that time, it was more about how they looked …the colors, the shape of the black pupil in the middle that changed sizes if they were relaxed or happy or in bright sunlight or in a dark room. Many of my school projects and 4H projects revolved around photography and my photographs were most often of cats. Especially their eyes. Many years later, when I was newly married and my husband and I were rescuing many stray cats, my interest in cat eyes changed its course. Many of the stray cats we rescued came with or developed cat eye problems. I wasn’t a veterinarian then so I didn’t know much about cat eye health. But by the time I had taken in and was living with 14 rescued cats, I had learned a great deal about cat eye care. The first thing I learned is that cats that are sneezing often get red, runny eyes and that means they have an upper respiratory infection. The same thing that we refer to as a “cold”. These feline eye infections are most often caused by a virus and most of the time, the virus causes conjunctivitis in cats, inflammation of the tissues around the eye. Occasionally, especially if the cat is a young kitten or is elderly or immune suppressed, this conjunctivitis is accompanied by ulcers on the front of the eye, the cornea. This can happen, in particular, if the virus is the feline herpes virus. A cat eye infection caused by a herpes virus can be devastating to the eyes of young kittens, leaving them with impaired vision or even complete blindness. As we were rescuing cats, I treated a large number of them for feline upper respiratory infections, including cat conjunctivitis. With a feline eye infection, ointment treatment usually is an antibiotic ointment, although many feline eye infections are viral in origin. Putting feline eye ointment or drops in cat eyes two or more times a day for many days wasn’t so difficult except one time when all 14 cats had conjunctivitis at the same time. That was very time-consuming! Unfortunately, that didn’t turn out to be the worst of it. When I rescued our 14th cat, I learned that there’s much more to feline eye diseases than conjunctivitis. The 14th cat that came to live with us was an adorable little gray and white kitten who I found by the side of the highway, hiding under a car. He was very shy and I had to crawl under the car and quickly grab him before he could be hit by a passing car. I took him to the local veterinarian for the usual feline leukemia test and exam before allowing him to be around my other cats. He was given an excellent bill of health and quickly became a much-loved member of the household. However, one day soon after that, I noticed his eyes were red, swollen and runny and also seemed a little cloudy in appearance. I figured it was the same conjunctivitis that all the cats seemed to get, but I quickly took him to the local veterinarian to be examined. The vet agreed that he had feline conjunctivitis and dispensed antibiotic ointment for me to place in his eyes twice daily. No worries, right? Wrong! Just a few hours later, I noticed his eyes were getting cloudier and cloudier and just a little bit later, it appeared that he couldn’t see at all! In a panic, I called the vet, but he told me to just keep putting the ointment in his eyes and that there was nothing else to be done. As the next hours passed, I had this horrible feeling that this was more than cat conjunctivitis and that he needed more than antibiotic ointment in his eyes. He wasn’t eating well and he also had a fever, but what bothered me the most was the cloudiness in his eyes and his lack of vision. Fortunately, my husband was as cat crazy as I was and suddenly we were jumping into our car with Noodles, our little kitten, and driving 2 ½ hours to the Animal Medical Center in New York City. You can read more about Noodles and our experience in New York and about the rest of his life at Feline FIP. What I found out that night was that he had a feline eye disorder called anterior uveitis, a scary word with a scary meaning. Said more simply, anterior uveitis means there is inflammation in the anterior chamber of the eyes. The anterior chamber is the part you see when you are looking at cat eyes. The posterior chamber is behind the lens, an area you cannot see without special equipment. The most terrifying thing I learned that night was that anterior uveitis in cats can indicate that the cat has feline leukemia, feline infectious peritonitis (FIP), or toxoplasmosis. All scary words. Anterior uveitis in cats is a treatable condition IF the underlying cause is treatable. If the underlying cause is feline leukemia or FIP or toxoplasmosis, the prognosis is poor. I later learned that approximately 50% of the cases of anterior uveitis in cats are idiopathic – meaning the cause is never discovered. Those cases tend to recover although they may have flare-ups from time to time. My experience, however, over the last 20 years of being a feline veterinarian, has been that very few cats actually get uveitis and the ones that I have treated had a serious underlying cause far more than 50% of the time. HOWEVER, if your cat ever has this feline eye condition, don’t lose hope! Treatment is possible and there is a chance that your kitty doesn’t have another serious feline illness and will have a normal lifespan. The treatment for uveitis, however, is very different from the treatment for conjunctivitis in cats, so it is critical to have your kitty seen by a vet for any cat eye problem so that the correct condition can be diagnosed and the appropriate treatment prescribed. A feline watery eye can be normal if it’s very temporary and the fluid is clear. Cats can get foreign particles in their eyes just as we do and they will generally resolve without treatment. Also, many cats have blocked tear ducts as the result of prior cat eye infections and will permanently have a clear fluid (tears) coming from their eyes. Cat watery eyes from blocked tear ducts are not a problem and will not affect their vision or shorten their lives. You simply need to wipe the accumulated discharge from the fur beneath the eyes because most cats will not clean that area enough themselves. If the discharge on the fur appears brownish or even a reddish brown, do not panic. It is not blood. When the tears from the eyes are deposited on the fur, normal bacteria in the fur degrades the tears and the result will be a brownish red color. This is normal and only needs to be wiped away gently. Feline herpes in the eye is a very serious condition, especially in young kittens. Many kittens have lost their vision permanently from feline herpes when early diagnosis and appropriate treatment could have saved their vision. Feline herpes eye symptoms include swelling, redness, discharge from the eyes, scratches or ulcers on the eyes, cloudiness of the cornea, and scarring of the cornea, and left untreated or caught too late can result in complete vision loss. Here’s a picture of a cat with one eye, the other lost to an early herpes virus infection, and although this one eyed cat leads a happy, healthy life, this is not what you prefer for your cat. Your kitten or cat needs to be seen immediately by your veterinarian anytime there seems to be eye problems. A feline red eye can mean several different things depending on which part of the eye is red. The tissue around the eye, the conjunctiva, can be red indicating conjunctivitis, or feline pink eye. This is a common cat eye condition and can be the result of a virus, bacteria, trauma, eyelid deformities, environmental irritants, or inadequate tear production. There can be fine red lines on the surface of the cornea which are blood vessels and should not be present in a healthy eye. These most often indicate that there is a scratch or ulcer on the cornea and can indicate a feline herpes virus eye infection. The white part of the eye, the sclera, can be red and can indicate glaucoma which, just as in people, means increased pressure in the eye and is an emergency. In assessing feline health, sunken eyes can indicate a health problem, especially dehydration, although many older cats especially ones who have lost weight or have hyperthyroidism have sunken eyes. One way to help keep your kitty properly hydrated is to encourage drinking with a cat water fountain, like the ones seen here.
. A feline eye periorbital abscess is a painful, serious condition. The eye will appear to be bulging out of the orbit and without diagnostic tests your veterinarian will not know for sure if there is a tumor or an abscess behind the eye. Feline eye cancer does indeed occur, but fortunately not very often. It can take the form of a tumor behind the eye as just mentioned or can be cancer of the eyelid. Cats also get melanoma of the eye, in which case you will see a change in the pigment, the coloring, of the iris, most often seen as brown spots. If your cat has brown specks in the eyes , remember that not all pigment spots are melanomas, but all should be examined by your veterinarian. Also, melanomas are most often very slow growing and your veterinarian can decide if treatment needs to be instituted or not, often depending on the age of the cat. Horner’s Syndrome occurs when there is damage to the sympathetic nervous system. That damage could be in the area of the eyes, ears, or neck. It can result from trauma or from diseases in the eye or behind the eye. Middle ear problems can also be responsible as can tumors in the brain, neck or chest. Feline eye ointment of various types are frequently used for cat eye problems. There are antibiotic ointments, steroid ointments, ointments to keep the eye dilated which are used in cases of anterior uveitis, anti-viral ointments used in herpes infections and others. A cat eye drop solution is generally available instead of an ointment if you prefer. I have a 2 year old male cat. I have noticed a white like film in the corners of both eyes. The inside corner by the nose. It looks like mucus and goes up about 1/2 inch. What is this? The mucus is white and doesn't seem to be seeping much down his face. Unless he is cleaning it before I see it. Thank you for your time. It sounds like you are describing a cat's "third eyelids". I have included a picture that illustrates a prominent third eyelid. This may be more drastic than what you are seeing. However, it should give you an idea if this is what you are seeing. If so, they are normal, but are not usually seen unless a cat is not feeling well. 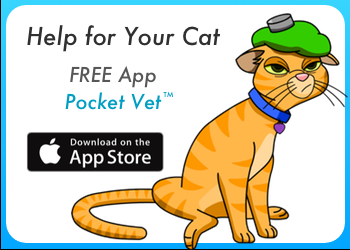 If your kitty is sneezing or not eating or acting very lethargic or showing any signs of poor health, you should have him seen by a vet. Watery eye related to tumor removal?